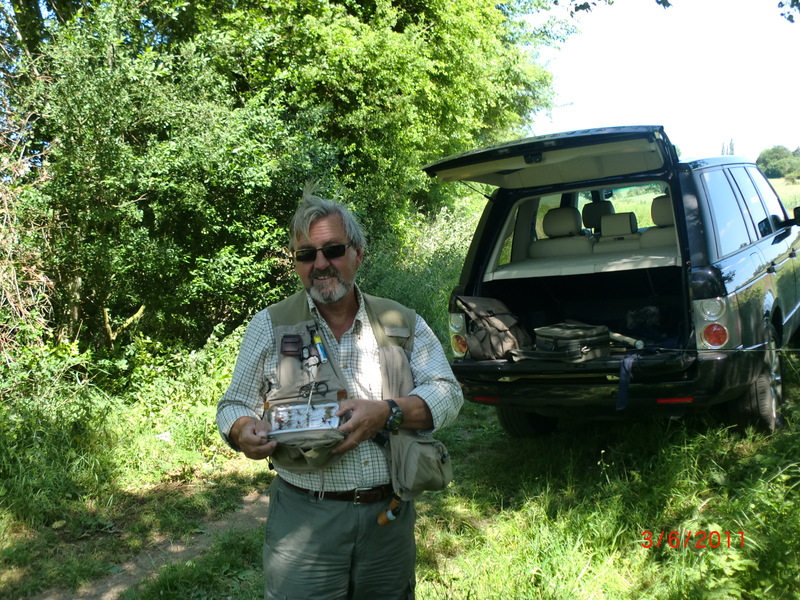 The opportunity to fish Hertfordshire again, originated from a conversation with a fellow Master in 2010…the Master of the Worshipful Company of Scientific Instrument Makers, Harry Tee. We met through the interminable lunches and dinners, but discovered a mutual passion during the traditional ‘end of term’ get together known colloquially as ‘The Ironbridge Weekend’ which enables the Alumni and spouses to mix socially outside of the City’ formality and out of town, and at the same time, learn about Telford’s massive contribution to the Industrial Revolution in our country. But Harry and I talked ‘fishing’! 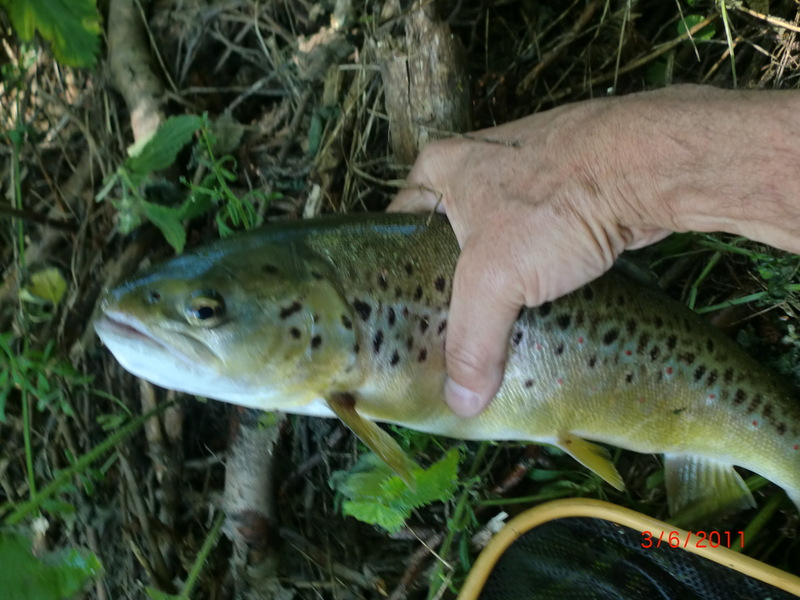 And he invited me to try for the trout on his syndicate’s stream. rather than a trout stream, but because it has been, it now has a head of wild fish, too. 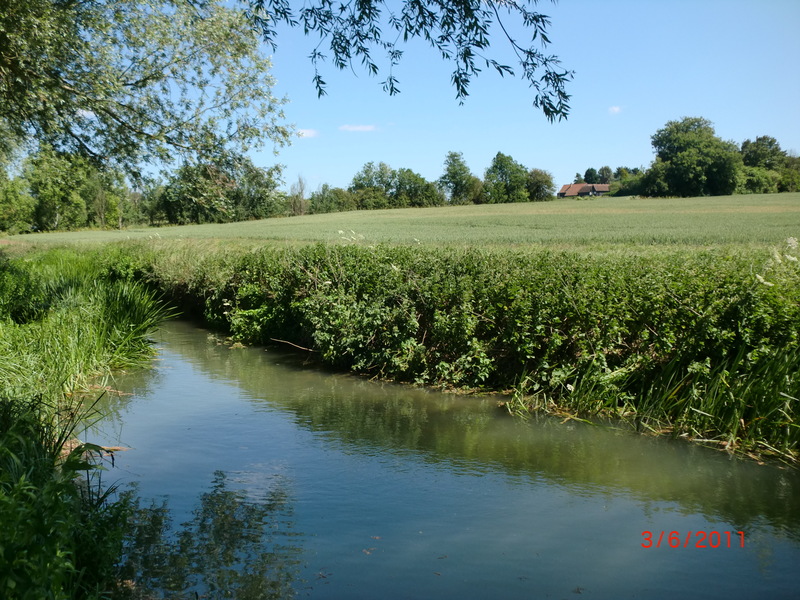 Originating near the East Hertfordshire village of Buckland it is 20 miles long and runs parallel with the A10 through Buntingford, Westmill, Braughing, Puckeridge and Standon until it reaches its confluence with the River Lea near Hertford. It flows over clay which, as it did when I visited, can discolour it, but on my visit this was because flows were slow after a Spring drought, and water levels were low. “A good storm will clean and transform it”, declared Harry, although a tinge of colour is the norm. His beat in Thundridge is leased to a small syndicate, known as the Fanham Fly Fishers Association, and its dozen or so members have a mile of river where, in addition to seeing the odd trout, I spotted a couple of shoals of dace, and I suspect the odd, rather large chub is hooked when emerging from under the roots of alder along this stretch. The fishing is tough. No manicuring here. 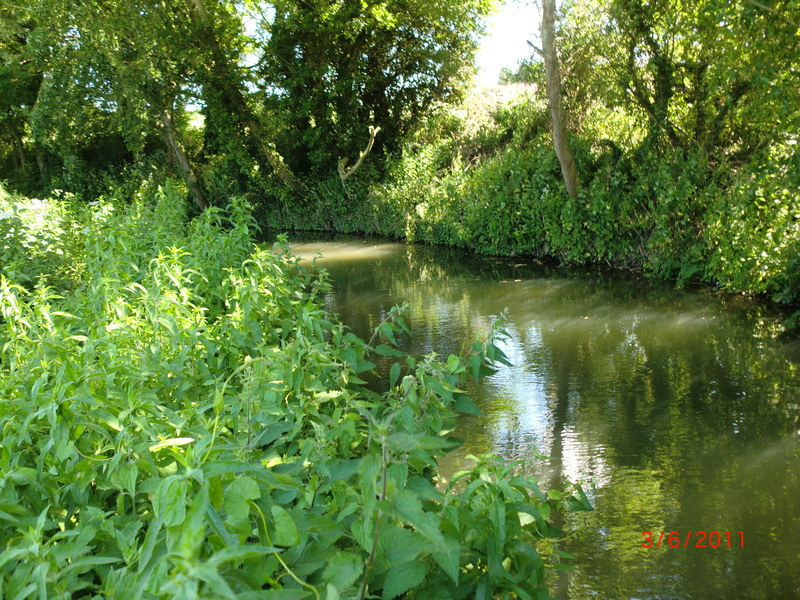 In fact in the adjacent farmland, the broad bean acreage, and the wheat, too, is only separated from the stream by the narrow margin of high nettle which made me grateful I was wadered, and this vegetation abbuts the six foot drop to the stream, which persuades members to bring long handle landing nets to capture their catch from above! And then there are the trees, bushes, stringy grasses, cow parsely et al. which combined with the side wind on this day, made casting a longer line and dry fly, testing to say the least. This is real, wild, small stream fishing, which Readers will know is exciting me, more and more. Flies this day were few and far between, and rises were scarce. But the sun was up, and maybe…a little later, perhaps? Harry got a ‘nudge’ to his Wulff, and when I spotted a rise upstream of him, I tied on a Greenwells but the wind prevented a sensible presentation through a tight line between the alders. In spite of my appalling faffing, huffing and puffing, the broad backed fish patrolling beneath me was not spooked by my dreadful attempts to reach the fish beyond him. I first thought him to be a chub, but when he gently rose to sip a fly and I spotted his spots, I started to concentrate, and turned into an Intrepid Stalker. Can you catapult cast a weighted nymph? I learned to, and fast…and quickly had a take. And that’s when I realised I had a problem…no long handled landing net! He was too heavy to haul out and up several feet of bank on my Moreno Borriero 4-wt bamboo rod, so I had to go down and get him! Sliding down through the nettles was easy, but the roots I planned to arrest my slide did not, and I was into four feet of water quickly, but the fish was well hooked and after several powerful deep plunges, he was persuaded into my tiny net. Stocking is done with fish around the pound mark by the syndicate, so at 2lbs. He must have been in the river a while. I caught a few dace later on a BWO cdc, too…crazy fishing this, but a little oasis of pleasure for the group who enjoy it…as I did…thanks, Harry.